Publix opens its first-ever supermarket on a main college campus at the University of South Florida this morning. The 28,000 square-foot-store will welcomed its first customers at 7 a.m., after a brief ribbon-cutting ceremony. USF president Judy Genshaft and Publix local division president Sam Pero are expected to be in attendance to make opening remarks. Publix employee Jackie Ortegon, 52, of Tampa scans grocery items in the dairy section during the grand opening of the Publix on USF's Tampa campus. USF apparel and other items are seen for sale inside of the new Publix located on 4425 E Fletcher Ave in Tampa. Madison Perry 26, left, a Publix cake decorator, adds some frosting for a customer during the grand opening of the Publix on USF's campus located on 4425 E Fletcher Ave in Tampa. 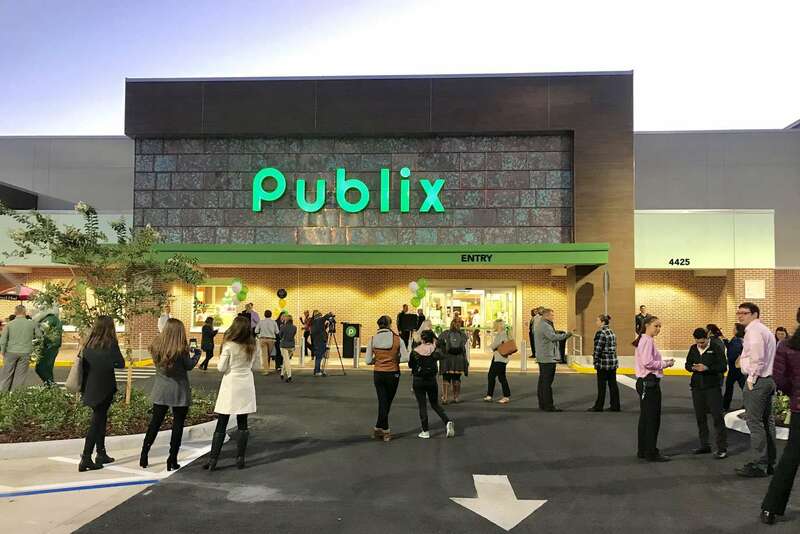 Publix opens its first-ever supermarket on a main college campus at the University of South Florida in Tampa, Florida on Thursday, December 6, 2018. Tina Johnson, of Tampa, a member of the USF Foundation, shops during the grand opening of the Publix on USF's Tampa campus. Jessica Dwyer, left, a Publix customer service team leader assists USF Bulls cheerleader Haley Ayrsman, 20, center and USF mascot 'Rocky the Bull' during the grand opening of the Publix on USF's Tampa campus. Amal Forbes, of Tampa, sends a text message to his daughter a USF student about the grand opening of the Publix on the USF campus located on 4425 E Fletcher Ave in Tampa. USF President Judy Genshaft, left, talks with Publix associates Mushir Alam, center, and Michael Ereon, a front service clerk during the grand opening of the Publix on USF's Tampa campus.